Tyler McCubbins, a biology major from Magnolia, was awarded for outstanding academic achievement at the 2009 Lindsey Wilson College Honors Convocation. At Honors Convocation, the college recognized more than two dozen students for their academic accomplishments during the 2008-09 school year. Air Force Airman Jeffrey M. Wrighthouse graduated from basic military training at Lackland Air Force Base, San Antonio, Texas, according to a Hometown News release. He is the son of Cecilia Semones of Magnolia. Recently gutted by a fire that authorities believe to be arson, the Lincoln Heritage House in Elizabethtown's Freeman Lake Park may be rebuilt with as much salvaged material from the original structure as possible. “I want to try to get a cabin back up there if at all possible,” City Councilman Tim Walker said. Salvagers have pulled from the rubble a few iron pots that had been around the fireplace, Walker said. 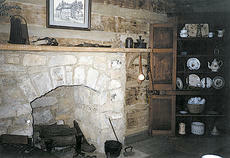 Some of the cabin’s contents dated back to the early 1800s. Only two weeks after a Bardstown city ordinance went into effect allowing the sale of packaged liquor on Sundays, Nelson County has followed suit. Magistrates voted to allow the sales in a 3-2 vote on second reading, with Third District Magistrate Bernard Ice dissenting and Fourth District Magistrate Tim Hutchins abstaining due to what he felt is a conflict of interest. Hutchins owns a convenience store and is involved in a pending lawsuit with the city involving annexation. An Elizabethtown man was charged with reckless driving and operating an all-terrain vehicle on the roadway May 24. “This four-wheeler came flying past the fruit stand and went in Y-Not-Stop sideways,” McCoy said. McCoy drove to the convenience store where the driver, Dustin Hathaway, 21, was putting gas in the vehicle. The City of Hodgenville will be spraying for mosquitos 10 tonight. Residents are urged to stay indoors if possible. If you have questions or concerns, call City Hall at 358-3832. Having served as an election commission for several years in another state, I understand the duties of an official and I also understand the passion for the job you are sworn to do and the peer pressure to make bad decisions. •Amanda Hayes as freshman softball coach at LaRue County High School effective Feb. 23. •Cindi Hartley as substitute bus monitor. •David Ramey, Joe Thurman, David Allen, Charles Benningfield, Jesse Skaggs, Thomas Vance and Ronald Hartley as substitute custodians at Hodgenville Elementary School. •Sharon Allen and Sabrina Whelan as part-time instructional assistants at Kids Crew.